If SWELL's purpose was to plant a stake in the ground and claim a role in the future of global payments in the face of mockery by SWIFT executives during the parallel SIBOS conference, then it was an unquestioned success. What's that? You didn't hear what SWIFT's CEO said at SIBOS? "It's not a swell, it's a tsunami." All right, let's dispense with jokes at the expense of SWIFT's CEO; it's too easy to ridicule outdated technology - instead let's focus on the future. The theme of the entire conference was interoperability and the transformative nature of Ripple technology, along with hard-hitting conversations and panel discussions regarding blockchain topics. All of the videos were live-streamed; a bold marketing move by Ripple in keeping with their "go big or go home" approach to all of their ambitious projects. "I'm curious to drill down a little bit further. Often, blockchain has been accused of being a solution looking for a problem, and vendors trying to sell wares or the next new-new thing. So I was interested in each of your cases. How you actually discovered the right problem to address with this technology; because, frankly, I'm cynical when it comes to tech. I've been around it far too long - and sometimes a simple database will do." 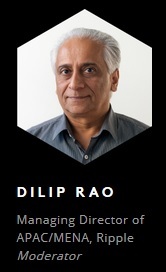 While this statement is from the moderator, the down-to-earth introduction as part of Dilip's question showcases how Ripple has the right approach when it comes to technology, and why I'm overwhelmingly confident in my XRP investment. It is critical thinking in action. ...the real proof point came when we tried to close the pilot down, and there was a lot of internal aching, such that we had to extend it, because people had suddenly found that it was a really meaningful solution to their problems." When a pilot takes on a life of its own and employees start to depend on it, rather than "in the wild applications" through more traditional money transfer companies, it's absolute proof of the value that Ripple technology brings for money transfer. "...however, when you go into more exotic currencies where liquidity is constrained for a whole host of reasons, having the ability to move in and out of that market on an on-demand basis and pick up liquidity that is made available through competitive exchanges where market makers, hedge funds, trading firms, retail speculators, are providing spot pricing against a local currency, is a very attractive tool to very quickly move in an out of these markets without having to go through the more traditional rigamarole of pre-funding an account, opening up credit lines, opening up bank accounts; so it's not a replacement, as I said before. It's more of a new application - a new tool - that treasurers can use." 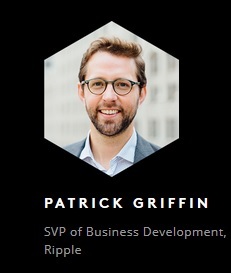 This is where I leaned forward to carefully listen - Patrick Griffin was basically describing xRapid and its use of XRP by Treasurers. There were other points of course; this collection of videos is sure to become classic reference next year when our community looks back for benchmarks on topics and subject matter. Something tells me that it will seem like ten years have passed instead of just one! SWELL started with a previously-unannounced collaboration between Ripple and the Gates Foundation6 that was unveiled on Sunday night before the conference began, and ended with a fantastic closing keynote speech from Don Tapscott. The news leading up to the conference was fast and furious, and included the opening of two new offices7 8 and the establishment of the RippleNet Accelerator program9 to promote production usage of XRP in worldwide payments. It's not often that one conference can gather such name-recognized personalities from across both traditional markets and the new fintech which are emerging to challenge those institutions. One panel contained Vitalik Buterin, the creator of Ethereum. 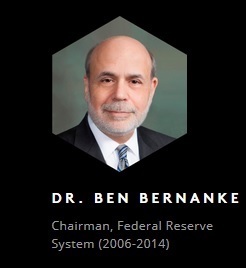 And in Monday's keynote, Ben Bernanke spoke and answered questions for over an hour. Both ends of the spectrum were represented by these icons; I'm still amazed that Ripple managed to get everybody together under one roof! 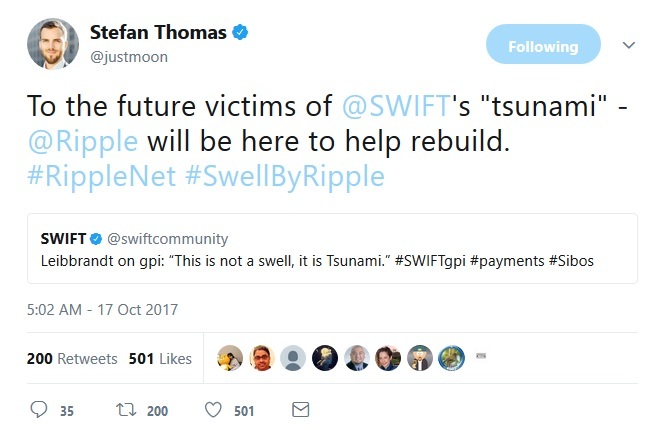 I'm very impressed by the Ripple team, and the planning and successful execution of the first international grouping of organizations to challenge SWIFT's traditional dominance in international payments is truly a ground-breaking accomplishment. Now they've got a tall order: start planning for next year! Let's talk about SWELL's impact from an XRP investor perspective. This news was exceptional. The market reacted accordingly, driving the price upwards quickly. Many day traders looking to make a quick profit from the uptick in XRP prices set their sell triggers at 29 cents. I know this from both anecdotal knowledge acquired on forums where their strategies are discussed, and also from vocal twitter accounts owned by alt coin day traders. While some XRP short-term traders followed suit, others opted to stay in the market Sunday night in anticipation of further announcements by Ripple. After all, the conference was a full three days. Question: Can we expect any significant announcements during the SWELL event? Answer: Ha. You think I’m gonna let the cat out of the bag today? Suffice it to say, yes - but Monica has me under strict embargo. We’ll be live streaming the event on our website so you’ll have to stay tuned! As a long-term investor, I had no plans to sell XRP during peaks of interest during the conference, so I was just mildly curious and enthusiastic about his comment. 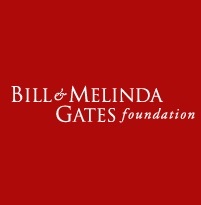 I also thought that the Gates Foundation collaboration was the "big news," as I know how large that foundation is, along with its potential impact. However, alt coin day traders read a lot more into Brad's statement than I did. They pointed to his use of "live streaming" and dissected it enough to justify more risk-taking. As the conference wore on, some of them began to realize that their positions were not going to result in a short-term profit, and they started to sell XRP at price points far below the highs reached on Sunday night. The price started to decline steadily. On Wednesday, Brad Garlinghouse held a Q&A session that was eagerly anticipated by the masses of XRP investors that were watching via livestream. This included those short-term traders that may have been holding all the way until the end of the conference, hoping for a significant announcement that was beyond the news of the partnership with the Gates Foundation. The previous night, a twitter account had circulated an unsubstantiated rumor that the escrow might be announced the next day. 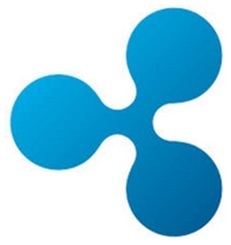 Again, there was no official response from Ripple to confirm or deny that an announcement regarding the escrow would or would not be made during the conference, so there were some traders that inevitably made buy and sell decisions around this possibility. The livestream ran into audio difficulties, however, so the short segment had to be recorded and released onto YouTube at a later time.20 The XRP investment community was disappointed, but personally, I didn't really mind, and made time to watch the recording of Brad's Q&A session prior to Don Tapscott's presentation. As Don Tapscott's presentation wrapped up and no announcement was made other than the Gates Foundation, the XRP investment community seemed to erupt in unison. On all forums that I visited, the anger was palpable, and seemed directed at what some considered misleading statements by Brad Garlinghouse. I don't think Brad Garlinghouse intentionally misrepresented facts. He said there would be a major announcement, and the Gates Foundation announcement was not on the agenda prior to its release as a news item on Sunday night. It was unplanned and kept secret, just like he indicated in the Quora session. To me, it was very clear that this was the big news. But I can see others' perspectives on this matter. I blog to bring attention to Ripple's incredible technology and XRP as an investment. My goal is to help the market value of XRP grow as much as possible by educating others and enlightening those readers who may not already know about XRP. My personal interest lies in the fact that I own XRP, and I'd like to see it appreciate in value; much like my fellow XRP investors. I think SWELL was a success. Do you want to know why? If you're one of those traders that is disappointed in the short-term price pull-back, think about SWELL in a completely different way. We've all seen the history of Bitcoin's price growth over the last eight years. Really, it's just been four years that Bitcoin has been measured in dollars instead of cents, but who's counting. On the way to it's current lofty heights, Bitcoin was pumped and dumped, and was subject to wild price gyrations. As it gained more and more publicity, the price seemed to stabilize....at least a little bit. Slowly, Bitcoin stopped being completely volatile, and its movements started to look more like a stock on Wall Street than a crypto-currency. This is tied to Bitcoin's volume. Now let's look at XRP. In August, during the 3-2-1 announcement of SWELL, XRP volume actually broke two billion dollars. And on Sunday-Monday of the actual SWELL conference, it exceeded the one billion dollar volume level. Without SWELL, these two volume records would not have been set. All price movements and publicity, along with the associated adoption of XRP as an investment by many thousands of traders, would not have happened. In this way, SWELL was not just a success from an XRP investment standpoint - it was a phenomenal success. As I stated, I do not represent Ripple - I am an XRP investor only, and I blog from that perspective. My opinions are my own, but I can tell you that I have much more in common with my fellow XRPChat veterans than I do to the company. We've held onto our investment through thick and thin since 2013, and gone through some amazing ups and downs together. Ripple's success = XRP's success. And because of SWELL, guess what other organization that bankers now think of when it comes to cross-border transfers of value? Ripple. The SWELL conference was a success for Ripple; it generated enormous enthusiasm for Ripple technology. One of the attendees at the event was a current employee of Deloitte and a friend of mine on Twitter and XRPChat. "Big Four" consultants like him are not paid to pull any punches in their analysis. Being there in person, he provided his unedited version of events at SWELL, and confirmed that banks are very enthusiastic towards Ripple technology. The overwhelming theme of the first SWELL conference was interoperability. The focus was consistently on ILP, because that's what gains traction with banks currently. While the crypto community may be impatient, this is how the world works, and SWELL's livestream offered an unscripted insight into just how conservative banks are when it comes to subjects like AML and KYC compliance. They know that banks are conservative. They formulated this strategy - and I agree with it - to emphasize interoperability and their ability to connect different ledgers together using ILP. This is what is giving Ripple fantastic traction to build their customer list; not forcing XRP to be used by organizations. 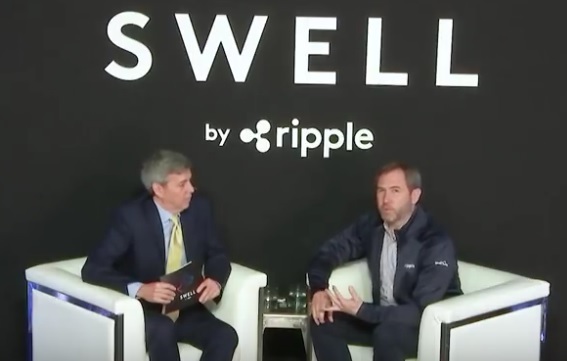 While Ripple organized and planned the SWELL conference to emphasize interoperability, they have not forgotten about XRP investors or about the need to quickly grow the XRP cryptomarket. 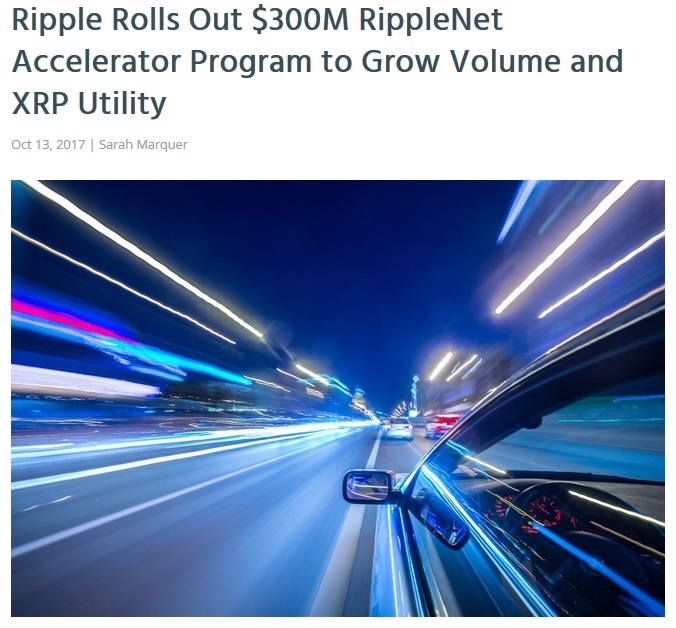 This is why they developed and implemented the RippleNet Accelerator program for banks and financial institutions. It's no coincidence that Ripple also released the Q3 XRP Markets report today; they are watching the cryptomarket closely, and are moving to meet our expectation for information without disclosing any sensitive details regarding their business alliances and partnerships just for the sake of a short-term XRP price increase. I agree with this corporate approach. After all, we're dealing with a US-based company that understands securities laws and is moving to help craft meaningful legislation about crypto. Ripple has consistently taken a very conscientious approach to managing XRP markets within the confines of treating XRP almost like a security, which is a prudent approach. Should Ripple Do SWELL #2 Differently? Perhaps one suggestion has merit. Do not livestream future conferences. Post a recording instead. I know this suggestion may not be agreed-upon by everybody, but posting a recording later after a conference provides the ability to avoid the real-time reactions of day-traders that tend to respond with overly-quick keyboards to information. It also is consistent with Ripple's culture of being open and honest about its content in every way possible with the cryptomarket. A recording serves to support this open culture, without risking the damage to XRP price levels by livestreaming. Don Tapscott noted that his son is working to bring an exchange online in Canada18 that will make purchasing crypto-currency as easy as buying traditional securities; this is one example of how blockchain technology is heading for mainstream adoption - perhaps more slowly than those of us would like, but keep in mind that this progress has been steady and inexorable. As the access to XRP is made more easy for ordinary investors, the liquidity and volume of XRP trading increases by leaps and bounds. At last count, individuals can purchase XRP against other fiat or crypto-currencies in 33 worldwide exchanges.19 This accessibility increases each week, and I hesitate to even predict how many places investors will be able to purchase XRP twelve months from now. No doubt the second SWELL conference will have developments and news that we can only make vague predictions of at this moment in time; Will there be one hundred banks using xRapid for instant cross-border payments one year from now? Until then, keep one thing in mind. We're early - very early. While some cynical day traders laugh at the "buy and hold" approach, this is one crypto-currency where that advice might just be correct.